With the ever increasing popularity of Render use within the building industry it is becoming more apparent that this type of finish is not maintenance free and our Render Cleaning Service can help keep your building in top condition and looking its best for many years to come. Due to environmental conditions Algae, Moss, Lichen and Fungi can begin to colonise on the render making the exterior surface of buildings appear dirty or in need of painting. Using a non-aggressive Biocide cleaning agent we can restore the rendered surface, eliminating the need for painting and associated access costs. 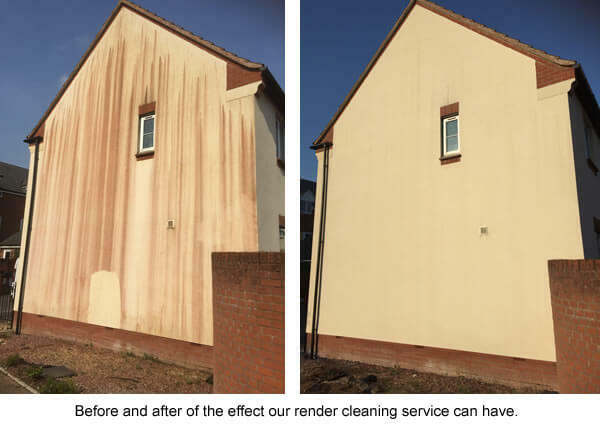 Unlike other exterior cleaning methods the product we use not only kills any Algae and Spores it comes into contact with but also has some residual benefit helping keep the surface of the Render cleaner for longer. We offer this service throughout Devon, Somerset and Dorset.